Itskov, a couple of years back, had a “spiritual change” that made him question the values of wealth and spending on luxury items. Since then he has pursued what he calls a global initiative to create “a new species free from the limits of biology.” Hence GF2045. 2045 is a significant milestone because, according to inventor and futurist Ray Kurzweil (a keynote speaker at GF2045), it is the year when the power of the human brain will be surpassed by that of the computer and also when we may merge with our machines and biotech to live indefinitely. The media have headlined the far out projections, claims and items included in GF2045's program - the androids, the prospect of brain enhancement, of life without death - instead of reporting Itskov's intended purpose for the conference: to raise awareness and concern about the unrelenting march of science without consideration for the prospect of a loss of humanity. 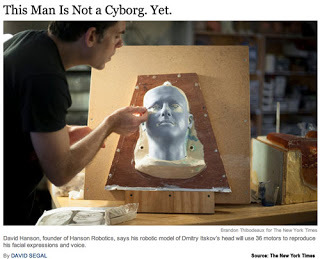 Headlines preceding the Global Future 2045 Congress proclaimed: WORLD’S MOST HUMAN-LIKE ANDROID TO BE UNVEILED AT GF2045. “The Dmitry Avatar-A head represents the most expressive facial robot in history and far exceeds the life-like characteristics of previous robot portraits of humans in both technology and artistry,” stated Dr. David Hanson. “The Dmitry Avatar-A head can establish eye contact, recognize faces, and carries out natural spoken conversation. In addition to the press releases, an in-depth NY Times article by David Segal described how it was being built, showed pictures of the work in progress, told what it was to do, and the personality and language characteristics that it was to incorporate. Well it didn't happen. None of it. Hanson was late and Itskov didn't like the robot in it's unfinished state. So the robot, Hanson and his AI partner Dr. Ben Goertzel were dropped from the program. Read the details here. 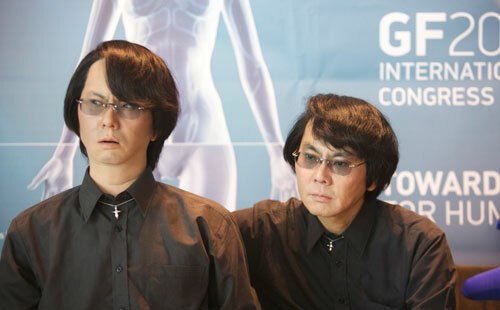 But there was still Dr. Hiroshi Ishiguro and his look-alike. Dr. Ishiguro showed off the little touches that make his androids so special: subconscious movement as well as reactive movement, e.g., the robot moves it's eyes, posture and gestures every once in a while - just like you do - as it sits idly. Day 1's keynote speaker was a thought-provoking talk by James Martin, the founder of the Oxford Martin School, in Oxford, UK. He described how we are faced with multiple extreme paradigm shifts as more and more of the world becomes digital and subject to software enhancements; shifts in the way we think about things that didn't previously have a software solution -- dangers that could just as easily thwart our growth -- or be antithetical to that growth. Martin described the process leading to 2045 as supremely challenging and Darwinian and that serious crunches were coming. Crunches in long-term thinking: China has the discipline and history to think long term while the US and EU do not. Corporations do but their ethics are different. Only corporations could use manipulation to market "Coal is Clean" and other similar campaigns. He talked about how the Oxford Martin School puts teams together for each critical global issue needing a solution... teams comprised of all the experts who are working toward that solution so that cross-pollination of disciplines and ideas occurs. 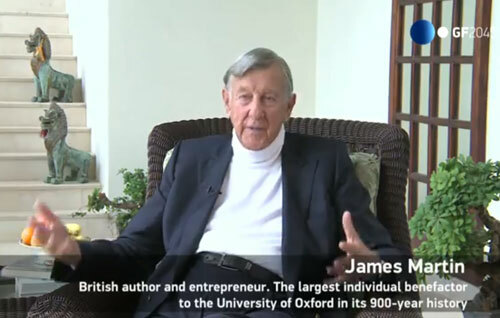 Talking with him afterward, he steered me to a video about the process called "Revolution in Oxford." I highly recommend watching it. "We are approaching a time when we can treat our biology as software and reprogram it." "There will be a time soon when we will add more time faster than time going by." "We are going to have to deal with the coexistence of open source and proprietary markets - as we do presently with books, music and college courses." "The world of physical things is now fully digital." 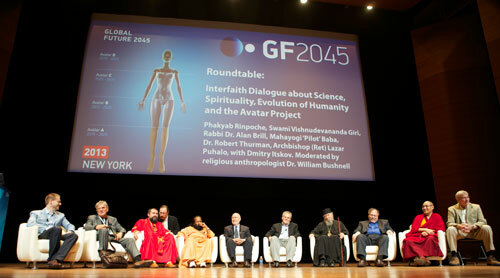 Other speakers included philosophers, ethicists, a man with a bionic arm, brain interface developers and neuro-prosthetics engineers, AI theorists, and a very colorful panel of global interfaith / spirituality leaders, all discussing the progress of, and implications and consequences of brain emulation, mapping and reverse engineering. Bottom line of all of the interfaith / spiritual speakers was to emphasize that we are preoccupied with the "how" of change and not the "why." That it's not science fiction that is happening; it is real and needs our attention and focus on the future. That change needs to be balanced with the spirit of humanism and, most importantly, we need a strategy to handle this inevitable transition. "The power to do great always comes with the power to do harm."